It’s amazing how thankfulness flows. It only takes one drop in an ocean of reasons to be thankful to start a ripple effect. Thankfulness in one area spreads to thanksgiving in other areas. I confess this post to be an example of such a thankfulness ripple. In expressing thankfulness for my husband, I see so many more things for which to give thanks. And so goes the dance. My husband is the most thankful person I’ve ever met. I am thankful to God for giving me a man that notices Him more than I do and points me to Him each day. In his thankfulness, he is always giving glory and praise to God. Even in this habit of praise, he continues to surprise me. It overwhelms me at times. I’ll begin with just one such instance. One night after he came home from work and didn’t enter the house for a while I found him just standing in the driveway, looking up. His face was filled with a childlike wonder. I joined him in the driveway, slippers and all, and looked up with him. Standing in the driveway admiring God’s creation, he urged me to take a walk with him. We needed to take our trashcan to the end of our private road for collection. The cool evening wind was still playing its inwardly beautiful, yet outwardly chilling song. So, I ran inside to grab my shoes and a wrap. I am thankful for this man who dances with me instinctively and in praise to God. He is full of wonderfulness too great to write it all. Most especially, for why he does it. He loves the Lord more than He loves me. I love that! He leads me and encourage me to notice Him and love Him more with each day. Oh, how numerous are the ways he shows me God’s love! His thankfulness leads me to recognize more of God’s handiwork and inspires me. 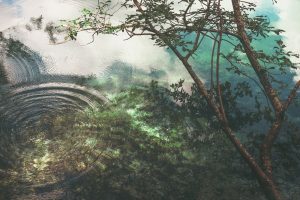 The thankfulness ripple effect. I am overwhelmed with thankfulness for the long road that led me here. Without it I would not be who I am or where I am today. Had I not endured and persevered through years of learning to dance this life alone I would not know this joy of dancing in the arms of this wonderful man God prepared for me. I am thankful for the rocky private road I traveled, and for God leading me, walking with me, and bringing me through dark nights. I’m thankful for clearings to see the other side of brokenness, uncertainty, and heartache. His healing in me long before I met Brian prepared my heart for this. And He continues to lead and teach me. It’s often said that you must learn to walk before you can dance. But have you ever seen a baby learning to walk? Sometimes they seem to dance a little in the process. When my girls were in the pre-walking stages holding on to things, they almost seemed to dance even before they walked. If they heard music they started bouncing or swaying in place. Granted, there is dance that one must first walk to do. But sometimes I think there are things where hearing a beat helps you get moving. God’s heartbeat teaches, motivates, and helps movement in the right direction. Have you heard His heartbeat? Let Him draw you close to hear it. His heart beats for you, beloved. You are a masterpiece of His creation. He adores you. He wants to sweep you into His arms and teach you to walk. And to dance. With Him. I took ballroom dance for a while. It seemed a natural activity to pair with music. I thought with that and my eager desire to learn that it might be easy. It was certainly a learning experience. God filled the dance floor with analogies and word-pictures that He used to teach me to dance with Him, and to follow His lead. From paying attention to the subtle directional hints from the dance instructor, to the placement of my feet in each step, I recognized so many parallels to life. I think I could write a book filled with them. Dancing was not the only thing I learned. Isn’t that like life? Are you on a difficult road? Is it hard to see? Keep walking with your hand in His. He knows the road and sees where it leads. He also sees the side roads that will tempt you to turn. He has designed it to work for your good. As you remain close to Him and walk with Him, the more you will reflect His light …and you’ll dance. Walking and dancing go hand-in-hand. Take His hand and let Him lead. Just follow His lead. Set the thankfulness ripple effect in motion by pondering one thing to begin thanking God for today. Praise Him for that and see all the other ripples of thankfulness that it may lead. It only takes one drop in an ocean of reasons to be thankful to start a ripple effect. Thank You Lord, for the gift of Your presence in my life. For how You pull me close and let me hear You. Thank You for Your heart that loves me and moves me to love. Thank You for using daily and temporal things to teach me eternal lessons. Thank You for preparing my heart and orchestrating my life in such a way that danced me through many stages and songs. Thank You for those songs… even the hard ones that cried out to You. You are my song and the reason I sing. Thank You for leading me and for never letting go. Thank You for teaching me that sometimes I just need to twirl in Your presence. You are the reason I dance. Thank You for the others you have put in my life to share the dance.